In LibCRM, types are how you organize the various person and organization profiles in your system. Each profile you add to LibCRM must be assigned a type, so setting up your types is one of the first steps you should take when setting up your system. Types allow you to record different info about different groups of users. For example, there may be information that you want to record about faculty that may not be relevant for students or alumni. 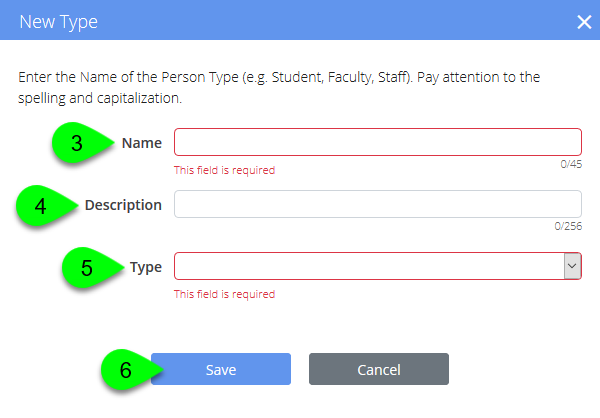 So, although all person types may share some basic fields (such as name and email address), you could set up a type just for Faculty with its own unique fields (e.g. publications, specializations, etc. ), while setting up another type for Students with a different set of fields (e.g. major, class year, etc.). In addition to Person types, like the examples above, you can also create Organization types. For example, you could create a type called Departments, which could contain the profiles for the various academic departments on your campus. If you want to track your interactions with vendors in LibCRM, you could create an organization type for them, too! Under the Person/Organization Types tab, click on the New Type button. Give your new type a name. Optionally, you can give your type a brief description. ​Person: a person type allows you to organize profiles for different individuals, such as students, staff, and volunteers. Organization: an organization type allows you to organize profiles for organizations large and small, such as vendors, departments, and branches.